Missing teeth can impact nearly every area of your life, compromising your ability to enjoy your favorite foods and creating an aged appearance. Fortunately, Dr. Stephen D. Lipman offers beautiful, natural-looking dentures to restore the look and functionality of your smile and bite. Dr. Lipman can discuss the benefits of various types of dentures at a consultation at our Windsor, CT, practice and determine which one is right for you. Depending on your needs, Dr. Lipman can provide full and partial dentures. Full dentures are designed for patients who are missing all of their teeth in the upper jaw, lower jaw, or both. Traditional partial dentures are an option for patients missing some teeth who do not want to receive bridges or implants. Conventional dentures can be removed at night or for cleaning. These types of dentures are held in place by an adhesive, natural suction, and the bony ridges of the gums. Conventional partial dentures are secured with plastic or metal pieces connected to adjacent teeth. Traditional dentures are relatively inexpensive but in some cases, they can slip and loosen, making eating and talking difficult. Dr. Lipman may also recommend conventional dentures to older patients who may not be able to withstand the oral surgery needed to place dental implants. In many cases, Dr. Lipman can place dentures during the same visit that damaged teeth are extracted. Implant-supported dentures may be an option for some patients. Prior to receiving dental implants, which are small titanium posts embedded in the jaw, some patients may need to undergo prerequisite procedures such as bone grafts, sinus lifts, and periodontal disease treatment. Once any prerequisite dental procedures have been completed, Dr. Lipman can refer you to a trusted periodontist, who will place will place four to eight implants in the jaw. Once the implants have fused with the bone and healing is complete, within four to six months, the dentures can be attached to the implants. 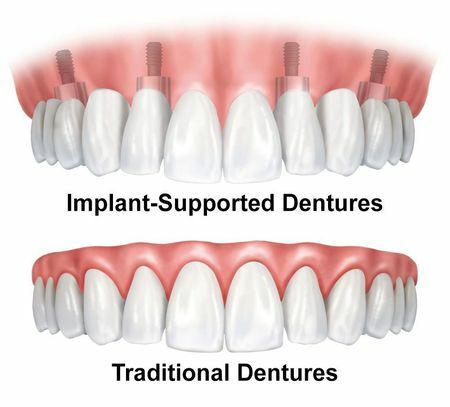 Since they will not slip, wobble, or loosen, implant-supported dentures are often preferred over conventional dentures, and can provide enhanced confidence during speaking and eating. In many cases, Dr. Lipman can place dentures during the same visit that damaged teeth are extracted. He may recommend a temporary soft liner until healing is complete and any necessary adjustments can be made. A soft reline can also protect delicate tissue until you have fully recovered from any extractions. In addition to improved confidence, dentures offer many benefits to patients who are missing teeth. Dentures can prevent any remaining teeth from shifting in addition to providing support to the patient’s facial structure. Once patients get used to wearing dentures, they may notice improved speech. Patients may also find they can eat a greater variety of foods and benefit from improved nutrition. Be careful not to drop removable dentures onto a hard surface, as they can break. Dentures should always be placed in water or a denture cleaning solution so they do not dry out. You should brush your dentures daily to remove plaque and any debris. Additionally, you should brush your gums, tongue, and palate before inserting your dentures in order to stimulate circulation and remove bacteria. Today's dentures are more comfortable and realistic than ever before. To learn more your denture options, contact our office today and schedule an appointment with Dr. Lipman.